This item is backordered from our supplier. We will ship as soon as it is received. Your credit card will not be charged until shipped. Please Note: For shipments to locations outside the USA, backordered items must be placed on separate orders. 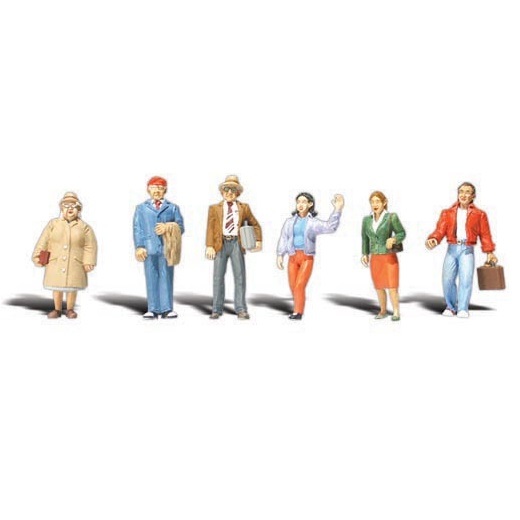 General Public Set (Woodland Scenics item A2730) in O scale includes six figures: 1 standing woman wearing trench coat and matching hat, 1 standing man with coat over arm, 1 standing man with eyeglasses and briefcase under arm, 1 standing woman waving, 1 woman walking with briefcase, 1 man walking with shopping bag. Note: Approx. actual size for a standing man: N = 7/16 inch, HO = 13/16 inch, O = 1-7/16 inches. Colors may vary slightly from those shown.